‘Tis the season! For every industry and organization, how the holiday season impacts the office differs. 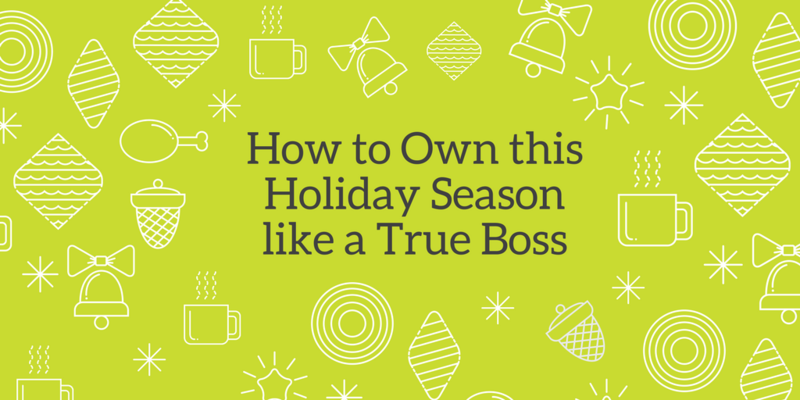 So this year instead of getting caught up in the tinsel and egg nog, we’ve complied our ultimate list of how to tackle the holiday season like a true B-O-S-S! While the holiday season is about family, peace and joy, some how we all seem to find ourselves wrapped up (pun intended) in finding the elusive perfect present! Your list of who to give what can become overwhelming. To keep the chaos under control, download the app, Santa’s Bag. The app keeps track of who wants what, your budget and even whether it’s wrapped or not! Whether its sending a holiday card, shooting them a quick email or typing up a quick InMail (LinkedIn’s version of messaging), the holidays are a great excuse to reach out to your network and connect. Not sure who to include? Mentors, previous and current bosses, ex-coworkers and miscellaneous connections. While having such a packed social calendar can feel overwhelming, it’s best if you go into each party focused and ready to network. So before you LOL at the thought of networking with your weird Uncle Sal, let us break it down for you. At the company lunch, sit next to someone you’d like work more closely with. Always had an interest in sales? Go mingle with them! Take this opportunity to separate yourself from your usual lunching partners and broaden the scope of who you’re developing a rapport with. Office holiday party? Take the opportunity to work up a casual conversation with some of the key stakeholders in your organization. And don’t be afraid to bring up work with your family (yes, even Uncle Sal), they can be some your biggest advocates in their own networks! While things can be a little quieter around the office during the holiday season, take the time to go over your emails and projects from 2017. Make an inventory of the things you’ve accomplished and the new skills you’ve gained. Whether your New Year’s resolution is to get a promotion or a new job, being proactive about doing this will help support those goals! Regardless of what your organization’s policy is for holiday time off, you’ll need an Out of Office email set up. Check out these tips from our friends at The Muse and while your there, check out our profile (because why not)!